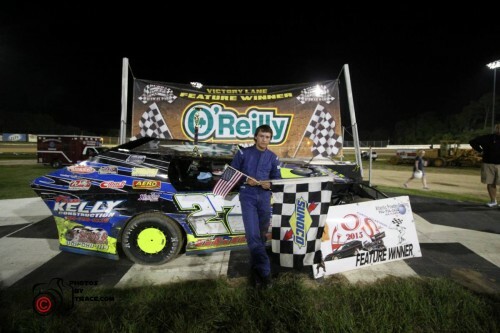 The Florida Outlaw E-Mod Series made their first visit to Bubba Raceway Park in Ocala Florida and “woweed” the crowd as the racing action was “loaded for bear” as 20 of some of the best E-Mods in the southeast started the feature event. 4 heat races were set up to qualify the impressive field and heat one saw Ft.White , Florida’s Nevin Gainey #0 give notice that he would try to continue his winning streak in the FOES season with a convincing win. Heat number two and Mcclenny , Florida’s Brandon Wells #39 and Jason Garver #27G had the fans standing for a side by side battle with Wells taking the win. Heat 3 Interlachen , Florida’s Josh Sanford #3 garnished the win over Live Oaks , Florida resident David Markham #00 with another spirited race. The last heat of the night the fans witnessed Garrett Lloyd of Jacksonville , Florida #27L let Gainey know his repeat might be spoiled on this night as he won over Don Strosahl #15 of Ocala , Florida. After a fantastic fireworks display from Galaxy Fireworks during intermission in was “go time” for the Florida Outlaw E-Mod Series and their feature event. At the drop of the green Don Strosahl jumped to the leadbut it didn’t take long for Garrett Lloyd to take command of the top spot and out front the battle shaped up for second on back as Nevin Gainey who started mid pack and Jacksonville , Florida’s Chase Collins #2X4 who started 18th worked their way towards the front. The first caution of the night would be for Trenton , Florida’s Shane Taylor #82 who spun on the frontstretch. On the restart they would make one lap before a multi car melee would erupt in turn four involving Dale Graham #14 , Shane Guessford #34 , Josh Sanford #3 , Dillion Ennis #111 , Marvin Hassell #29 , Jerol Stepp #23S and Todd Greeninger #58. Greeninger’s night was over with some extensive damage Sanford and Stepp would also go to the trailers. 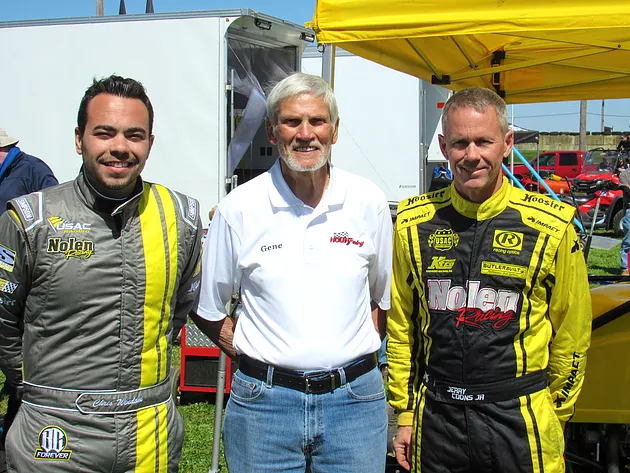 On the next restart Lloyd would still lead but an intense race for second would come to life as Strosahl , David Markham , Nevin Gainey , Brandon Wells , Seth Geary , Brandon Elwood and Chase Collins put on a show. Another multi car tangle with Graham , Ennis and Guessford on the backstretch would bring out the final caution with Ennis pulling in. On the restart Garrett Lloyd , Nevin Gainey and Chase Collins would decide this one with a one , two and three intense finish. Brandon Wells and Seth Geary rounded out the top five. 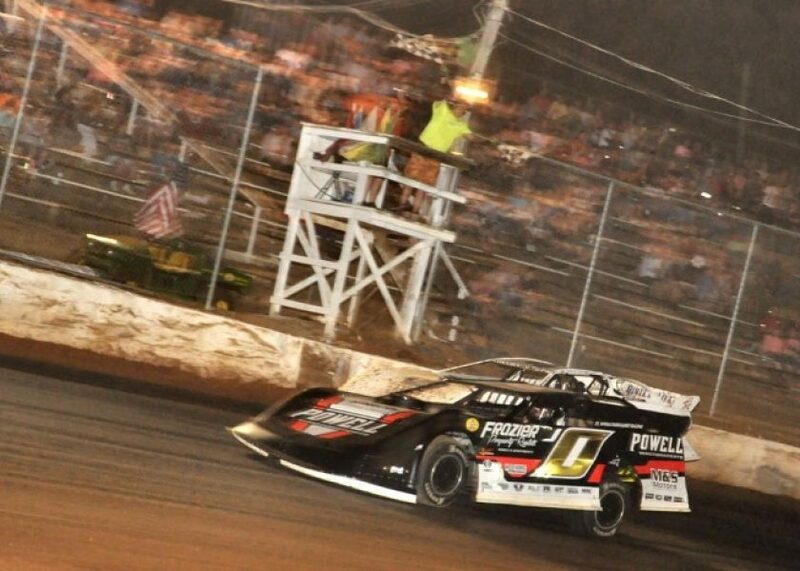 The next points race for the Florida Outlaw E-Mod Series is at Volusia Speedway Park on July 18th and this could end up being just one of the hottest series in the southeast with exciting three wide action at each show.